How Much Mulch or Soil Amendment Will You Need? Triangles: Measure the two sides that meet at a right angle. Multiply the length of one side by 1/2 the length of the other side. It doesn’t matter which is which. Circles: Measure the circle’s radius (½ way across the center of the circle). Multiply the radius by itself. Then multiply that number by 3.14, to get the circle's area. A circle's area equals pi (3.14) multiplied by the radius squared. Curves and irregular shapes: Weave a rope, hose or extension cord along the borders and then straighten them out to create a more regular shape. Use one of the formulas above. You may need to break the garden into smaller sections and add them together. If you are starting a new garden, you will want to add amendments to the entire area of the garden. Use the actual square footage for your calculations below. Once you know the total square footage of your garden, approximate the percentage of the garden that is not occupied by plants. (Ex. 1/8, 1/4...) Multiply the actual square footage by the percentage not occupied by plants. The resulting square footage is the number you will use for your calculations below. Actual square footage = 800 sq. ft.
800 x 1/4 (.25) = 200 sq. ft. Decide how deep you want your mulch (2", 3"...). Use the chart below and select the number of inches of coverage. Look across to the corresponding number under "Materials Sold by Cubic Yard". Divide the square footage of your garden by the number from the chart. Your garden has an area of 200 sq. ft. and you want 4 inches of mulch. The corresponding number on the chart for 4 inches of mulch is 80. Divide your sq. footage (200 sq. ft.) by 80. 200 divided by 80 = 2.5. 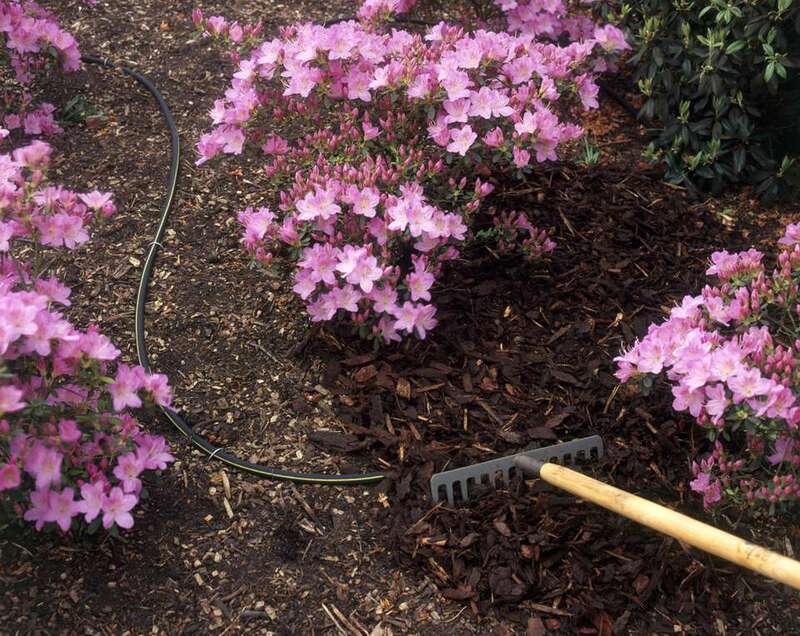 You would need 2 ½ cubic yards of mulch to cover a 200 sq. ft. garden with 4 inches of mulch. Bagged mulch is sold by either weight or cubic volume. There are 27 cu. ft. in a cubic yard. The average 40 lb. bag of mulch is approximately equal to 1 cu. ft. So whether you are buying 1-cubic-foot bags or 40-pound bags, the math is the same: multiply the number of cubic yards you need by 27. In our example above, we needed 2.5 cubic yards. Multiply the number of cubic yards you need (2.5) by 27. 2.5 x 27 = 67.5 bags of cubic foot or 40-pound bags of mulch. Note: If you are purchasing mulch in 2-cubic-foot bags, you would multiply by 13.5. (2.5 x 13.5 = 33.75).